You can take photographs inside the Museum and Archaeological zone without flashlight. It might damage archaeological pieces. Visiting hours: Tuesday to Sunday from 9:00 to 17:00. The $70 MXP fee includes the admission to the museum and the archaeological site. Children under 13, students, teachers and senior citizens presenting a valid ID do not pay. Free admission on Sunday. There is a fee if you are willing to shoot with a videocamera. Temporary exhibitions, auditorium, library, guided tours, museum miniguide, educational workshops, summer courses, bookstore, parking lot, wheelchair facilities, checkroom. Student advisory. The Templo Mayor Museum was inaugurated in 1987. This building was designed to exhibit the archaeological findings of the zone that used to be the Main Temple of Mexica peoples. The collection shows the political, military and aesthetic relevance of the city that dominated Mesoamerica before the Spaniards arrived. The Coyolxauhqui monolith discovery on 1978, enabled the archaeologists to find the exact place where the pyramid stood, since the Huitzilopochtli myth tells that he threw his sister down from Coatepec mount. 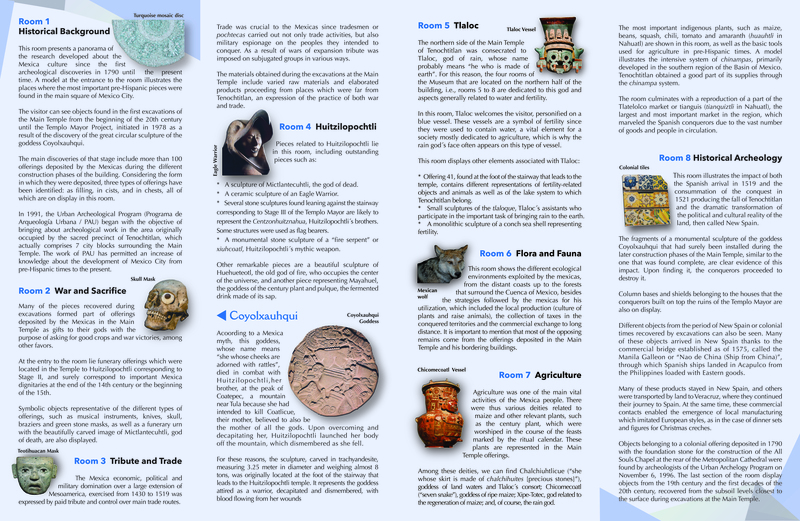 How can I realize the payment of the tickets to The Templo mayor Museum? The price for each ticket is $75 Mexican pesos, please check the exchange rate for the day you make the transfer. 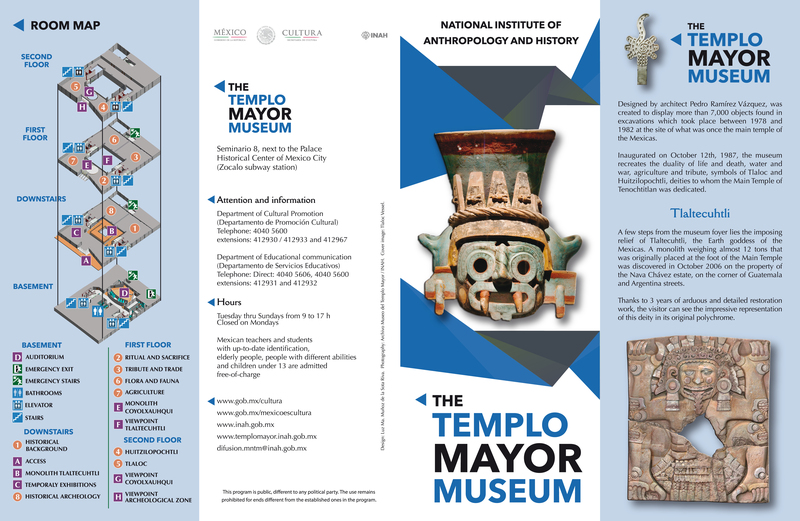 -You can also buy the tickets online at: www.inah.gob.mx, click on Boletos en línea, from there you look for Templo Mayor tickets. NOMBRE DE LA PLAZA: MÉXICO, D. F.
NOMBRE DEL BANCO: BANCO NACIONAL DE MÉXICO, S. A.
DIRECCIÓN DEL BANCO: ISABEL LA CATÓLICA No. 44, COL. CENTRO, MÉXICO, D. F.
NOTA: EN CASO DE TRANSFERENCIAS ELECTRÓNICAS DEL EXTRANJERO, NO PONER EL NÚMERO DE SUCURSAL, ÚNICAMENTE LA CLABE INTERBANCARIA DE 18 DÍGITOS 002180087000361554.